Debutant of the year: Mohammed Shami injected a much-needed dose of pace into the Indian attack. Will he able to replace Zaheer Khan as its leader? The ESPNcricinfo Awards recognise the best individual batting and bowling performances in cricket over the calendar year. 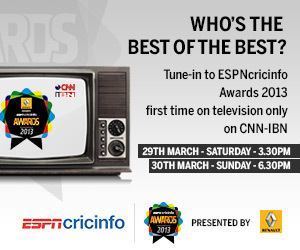 They are voted on by an independent jury of former cricketers, commentators, and ESPNcricinfo's senior writers. Previous winners have included Dale Steyn, Virender Sehwag, Shahid Afridi and Kumar Sangakkara. A high-powered jury of cricketers, current and past, cricket writers and commentators picks the player of the last 20 years to cap ESPNcricinfo's 20th anniversary celebrations. This award, the winner of which is nominated by Rahul Dravid, recognises significant contributions to cricket in a non-playing role. Which batsman was the most consistent over the year? Who was the best bowler in the third and fourth innings? The Statsguru Awards go beyond runs scored, wickets taken, or averages, and are the result of detailed data analyses of performances. ESPNcricinfo's ball-by-ball data analysis of every international game has answers to these queries and more.